it can be set to specific user needs. Linda Beloff, Manager in "Children's Village"
One of the most essential and effectual assets of any small business is the database of customers as it is an effective foundation for different successful marketing programs to perk up their business. Basemaster feels proud to offer small business database software to help small businesses to grow big. We give them the tools for easily managing assets, tasks, projects, people and many more aspects of business. Customers can use our software for managing their information, smoothly running their business processes and also be more profitable during the office or on the go, without worrying about outdated or expensive software or hardware. ✔ Create unified online database of clients, invoices, orders, tasks and other info. You don’t have a business-specific table? Now it’s not a problem – just make it! ✔ Male-out info via e-mail. ✔ Assign tasks, manage and control them. ✔ Prepare reports and track the performance of each staff member. Our strategy is to offer the most competitive prices along with the highest functionality for this segment. We offer different tariff plans and you can choose which one suits you best. Moreover you will be able to change your rate plan at any time without the need to transfer the data. ✔ Instant start. You don’t need installation or any settings. Just create an account and get down to work. ✔ No need for equipment. You don't have to buy a server or hosting. We have it all. ✔ Access from all around the world. You can use the program anytime, anywhere. ✔ High reliability. All servers are located in safe data centers. The data are daily backed-up. ✔ Economic efficiency. Pay monthly and manage the number of users on your own. ✔ Security via HTTPS. Each account has its own security certificate. ✔ Security via IP. The program can be accessed only from particular IPs. ✔ Security from deletion. It protects the data from being removed: basket, back-up or system log. 2. 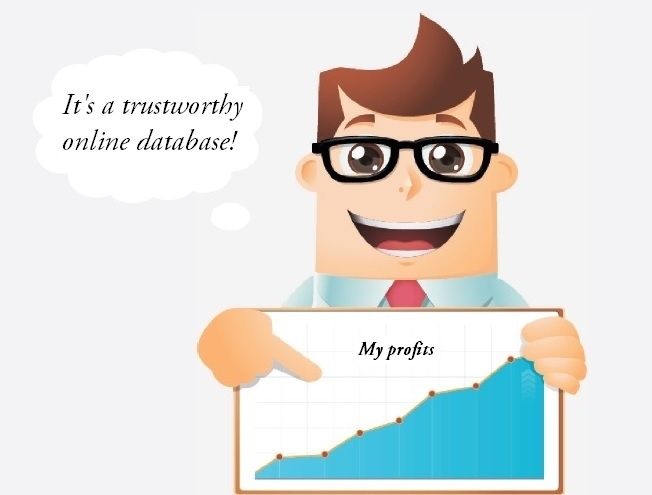 Build your first online database!